My name's Hollee Saville and I am blessed to work with children and families every day. 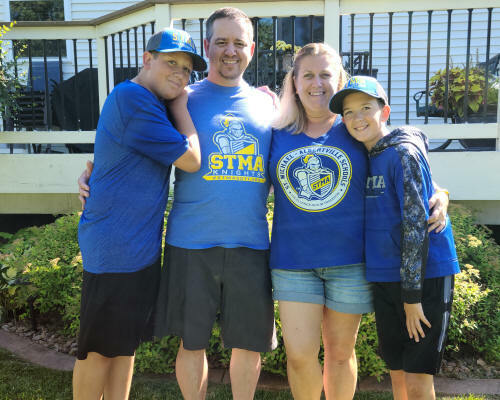 I am originally from San Diego, but have lived in St. Michael since 2004 with my wonderful husband, Jonathan, and our sons, Jaxen (12) and Preston (10). In my "free time," I love hanging out with my family, playing games and cards, volunteering in the community, advocating for early childhood, designing websites, and baking. I graduated from the University of San Diego in May 2000 with a Bachelor of Arts degree in History and attended USD and California State University San Marcos towards a Master of Arts in Teaching. I earned my Masters in Early Childhood Education from Concordia University in May 2014. I care for children because I truly enjoy being with them and helping them grow. I have been teaching children for more than 20 years. Over the years, I have worked as a teacher and assistant teacher in myriad schools and programs, with children from infants through high school. I have extensive experience with children with special needs, as well. I have attended thousands of hours of relevant trainings and attend many more trainings than my license requires. I am CPR and First-Aid-certified for all ages, and I have taken Child Car Seat Safety, SIDS/SUIDS, and Shaken Baby Syndrome/Abusive Head Trauma trainings. I also present hundreds of hours of trainings each year. I serve as President and Communications Director for the Minnesota Association of Child Care Professionals (MACCP), am a member of the Alliance for Childhood, and serve as the Website Coordinator for the Wright County Family Child Care Association (WCFCCA). I also subscribe to several publications that expand my knowledge of all aspects of childcare, child development, and early childhood education. I believe that the more I learn, the better teacher I can be.